Terry Johnson's new abstract beach paintings are a radical and exciting change, from his usual, structured style, to something much looser and more responsive. 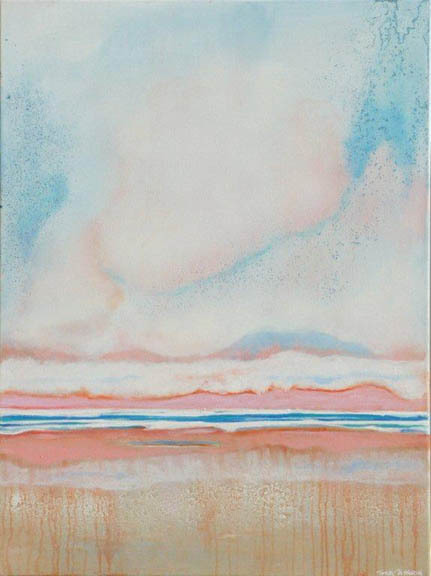 When in Port Douglas he enjoys morning and evening walks along Four Mile Beach, appreciating its changing moods, movement and colour. 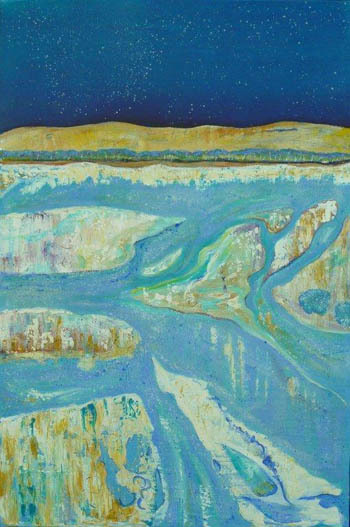 He is particularly interested in the effect of light on the movement of incoming and outgoing tides, especially when the tide is at its lowest. 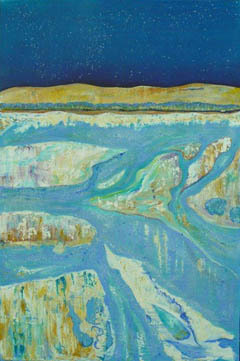 Light from the rising or setting sun reflects on the surface of the tidal pools and wet sand in an ever-changing dance. The artist is drawn in to this performance and becomes part of it. 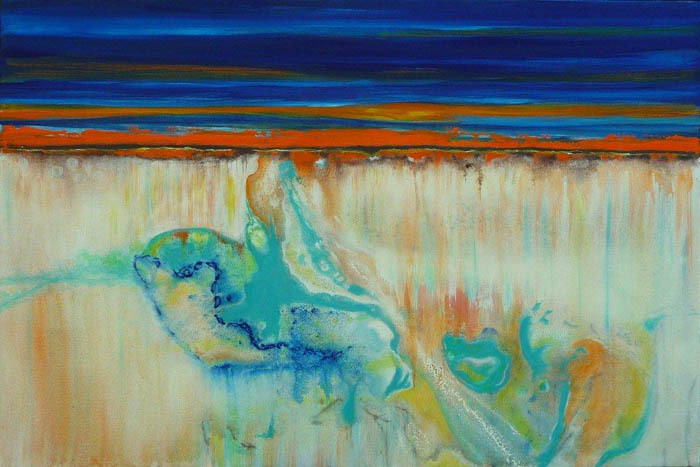 Beach paintings capture reflections in wet sand. Terry says that the best time to observe this reflection and refraction seems to be in the late evenings and early mornings, I suppose because the light is coming at such a low angle then. Cumulous, stratus or the very high, icy nimbus clouds all gather on the horizon and reflect in tidal pools and wet sand, as do the rainforest trees which grow close to the edge of the beach. 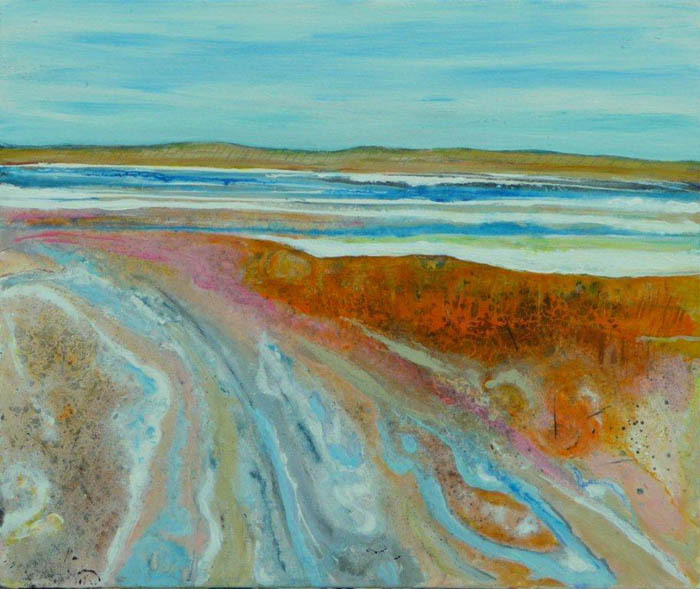 Terry is especially fascinated by the textural nature of the reflections in the wet sand and explores that aspect of Nature's display in these new beach paintings. He explains that the placement of a horizon line in the picture plane evokes a sense of landscape in the viewer. 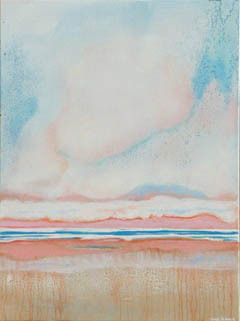 In 'Low Tide, Big Sky', to the right of this page, the artist is looking up at the sky from ground level. As I am sure you know, another term for 'horizon' is 'eye level', so one's perspective, hence the horizon line, changes according to where ones eyes are. 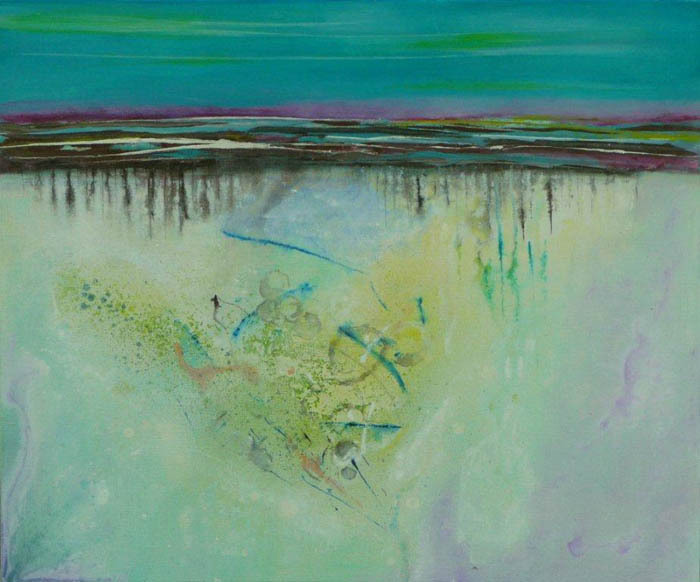 'In the Shallows' is a view of a pool, looking down from above, small fish trapped and unable to escape until the next tide comes rolling in. Sometimes photographers will use a small ladder in order to raise the horizon higher and, therefore, to fit in more of their subject. 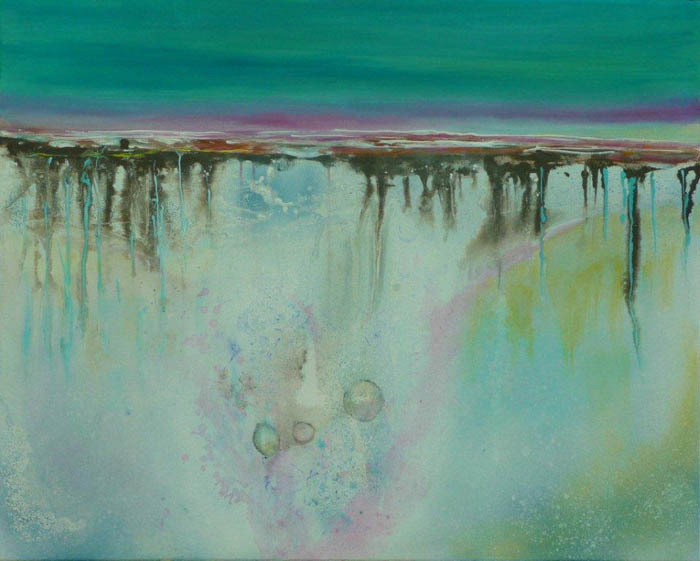 Terry explains further, "Low Tide Reflections 1 and 2 are based on sand texture caused by the water running back to sea as the tide retreats. Reflected in the sand is also a beautiful cloud formation and a glimpse of blue sky. 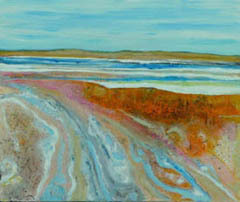 In painting Tidal Islands ....I found ephemeral streams that flow back to sea after a very high tide or beach storm. Look closely and you will see that they are a micro version of coastal drift , meandering streams, sandbars and deltas." 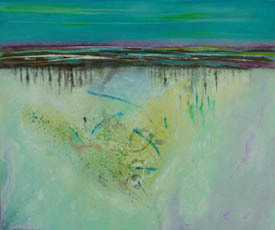 Enquire about Terry's abstract beach paintings.